Many folks have knee or hip problems, and going up and down stairs just makes them hurt all the more. But, with stair lifts, you don’t ever have to worry about the pain climbing stairs causes you again. We offer a variety of vertical platform lifts to help people get into and around in their homes, from some of the most trustworthy names in home accessibility. Ceiling lifts are a great solutions to help people with mobility challenges, their families and caregivers, both in constricted and open spaces. Ceiling lifts reduce injuries that can occur when lifting or transferring a person. They are installed on overhead rails (permanent or free standing). And, are ideal to increase safety at home. you can create new spaces in your home that will fit nicely into your life at home with a home addition. 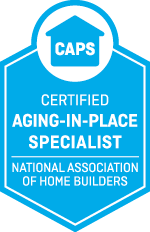 By choosing Safe Living Solutions to add new rooms to your house, you’ll be benefiting from our decades of remodeling and construction experience, as well as our dedication to accessible design for all ages. If you have stairs in or outside of you home, now is a great time to start thinking about how you can use these two types of products to keep you at home, longer. We offer several brands of stair lifts and vertical platform lifts to keep you safe and make your life easier. Safe Living Solutions in High Point offers a variety of ramps to help you stay independent at home. We can install or build several different kinds of ramps, including portable wheelchair ramps (folding ramps), modular aluminum ramps, threshold ramps and custom-built wooden ramps. We offer a number of accessibility products to help make your home is easier-to-use, more enjoyable and safe for you. Every product is installed by our experienced accessible remodeling team, which means you can rest easy knowing it is done correctly and work as it should. Aging in place is a term used to describe living in the home of your choice for as long as you are able as you grow older. while being able to get any help or support you might need. Our accessibility team can remodel your home so it is easier and more enjoyable to live in now, and will support you later in life.